Presenting our clients with the best-in-class Ready to Move in Cabin. We manufacture these products by making use of high-grade basic material, procured from the established names of the industry. 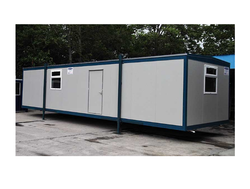 Conforming to the defined parameters of the industry, these cabins can be installed at construction sites. 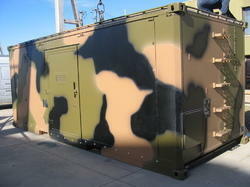 We have gained immense expertise in offering a supreme grade range of Military Shelters. The military shelters offered by us are widely appreciated in the industry, owing to their compact structure, easy usage and high strength. 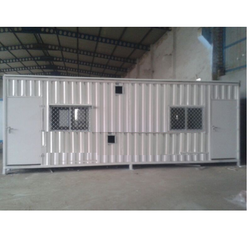 We manufacture Container Site Office product using high grade basic such as prepainted galvanized iron and PUF insulation. Our bunk house / container office is rust proof, dust proof, heat insulated, attractive looks, durable, easy to use and shift. We hold expertise in designing and developing a significant range Liftable Portable Cabin. Liftable portable cabin has a USP of space and insulation quality. Since these lift-able portable cabins are customized make hence the space available in these cabins are more than any other available option also the level of insulation in this cabin are far more superior than any other portable lift cabins. These cabins can be made in any odd size as well, which makes these cabins more customer oriented product. SRG International manufacture Mobile Cabin product using high grade basic such as prepainted galvanized iron and PUF insulation. Our bunk house / container office is rust proof, dust proof, heat insulated, attractive looks, durable, easy to use and shift. 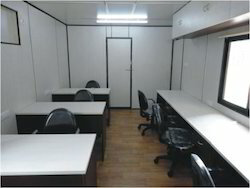 Backed by meritorious professionals, we hold specialization in designing and developing qualitative Lift and Shift office Container. 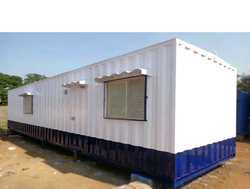 SRG office containers are a best solution for temporary or permanent site office. 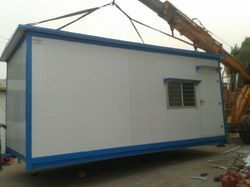 Our container site office can be attach with toilet and bathroom which makes these cabins livable. Our office container is ideal for living of human being since these cabin can have the arrangement of pantry.